The principles of wavelets can be applied to a range of problems in civil engineering structures, such as earthquake-induced vibration analysis, bridge vibrations, and damage identification. This book is particularly useful for graduate students and researchers in vibration analysis, especially those dealing with random vibrations. Wavelet Analysis in Civil Engineering explains the importance of wavelets in analyzing nonstationarities in ground motions. The example of a tank is considered to develop the problem and the model (based on linear assumptions) and several case studies are explored—fixed base, flexible base, lateral and rocking motions of foundations, with and without fluid—to explain how to account for ground motion nonstationarities. Bridge vibrations caused by vehicle passage are explored, as is structural damage identification. Wavelet analytic techniques starting from single degree of freedom systems to multiple degree of freedom systems are set out and detailed solutions of more complicated problems involving soil and fluid interactions are presented. Separate chapters have been devoted to explaining the basic principles of the wavelet-based random nonstationary vibration analysis of nonlinear systems, including probabilistic analysis. Wavelet Analysis in Civil Engineering explains the importance of wavelets in terms of non-stationarities of ground motions, explores the application of wavelet analytic techniques, and is an excellent resource for users addressing wavelets for the first time. Dr Pranesh Chatterjee has earned undergraduate and postgraduate degrees in civil engineering and subsequently adoctorate in engineering from Jadavpur University, India. Dr Chatterjee took up post-doctoral fellowship in structural mechanics at Katholieke Universiteit te Leuven in Belgium and then was selected as prestigious Pierse Newman Scholar at University College Dublin in Ireland. He is working as Manager of Plasticity and Tribology group of Tata Steel Europe in the Netherlands. He is active in research and publication of research works. "I believe that this book will be an important contribution in the area of structural dynamics, particularly pertaining to civil engineering. 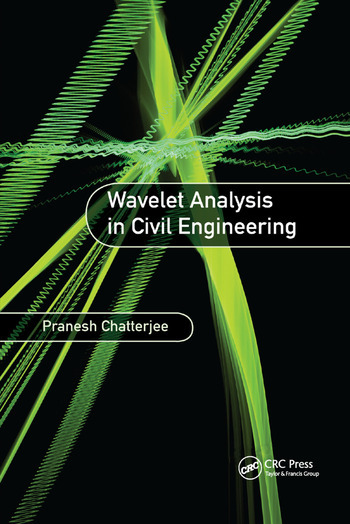 …the content is crisp yet highly comprehensive and most importantly explains wavelet from a civil engineering outlook."